What is it? The roots of rice stretch back thousands of years to Asia, where the grain became the staple food for millions and spread around the world as explorers realized its value and carried it along on their travels. It is rumoured that over 80,000 varieties of rice exist. Whether brown or white, rice is the grain of the Oryza sativa plant. Brown rice is the more healthful of the two because of the way it is handled. To make rice edible, the outer shell, or hull, of the grain must be removed. Shucking off the hull of rice exposes a fatty layer that can become rancid. To extend shelf life, this layer is often polished off, creating white rice. But along with the brown colour goes most of the rice's nutritional value! In fact, white rice may be "enriched" to add back some of the nutrients lost in the refining process. What is it good for? It's true: Brown rice will not last as long in your pantry as white rice, and it takes twice as long to cook as white rice. But the nutritional benefits of brown rice are worth the extra effort and time. One cup of brown rice comes with a little over 200 calories and only 2 grams of mostly unsaturated fat, but provides 4 grams of fibre and 5 grams of protein. Brown rice is also a source of several vitamins and minerals, and is particularly rich in manganese. Refined white rice boosts calories but loses most of the essential fatty acids, fibre, and B vitamins you'd get from brown. What does it taste like? With the bran and germ still intact, brown rice has a nuttier, more savoury flavour than sweeter white rice. After cooking - with 2 parts water to 1 part rice - brown rice can be enjoyed in many ways. It provides a satisfying base for stir-fried vegetables and sops up sauces well. Brown rice can be stuffed inside bell peppers or mushrooms or heated with milk and your favourite seasonings to make a rice pudding. And roasted brown rice can add a toasty note to brewed green tea. 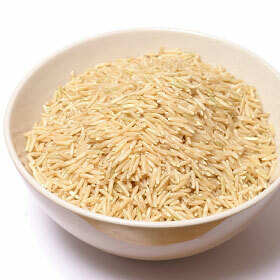 To stall spoilage, store brown rice in an airtight container placed in either or a cool, dark spot or the refrigerator.